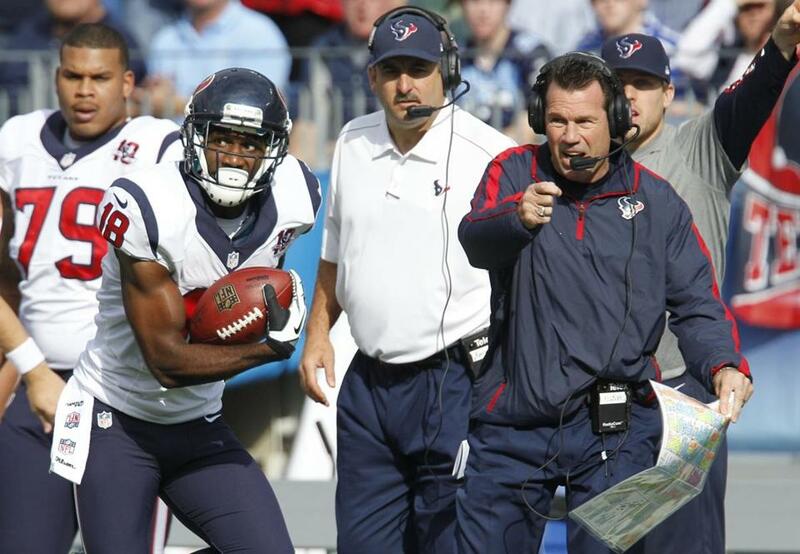 Houston coach Gary Kubiak, right, in his seventh season with the team, led the Texans to their first playoff spot last year. HOUSTON — Bob McNair wanted a hockey team, but the NHL, which preferred deserts to derricks, said no. So he ponied up $700 million for an NFL expansion franchise in 1999 and got Lamar Hunt’s permission to use the name of the Dallas AFL team that had moved to Kansas City in 1963. It’s been a decade since the Texans first donned their deep steel blue, battle red, and liberty white, but at the moment they’re at the top of the league, their return ticket to the playoffs already secured. Whether the Texans can clinch the top seed and home advantage throughout the playoffs is less important to them than the fact that they’ve qualified for the postseason twice in a row. That may be taken for granted in Foxborough, but it’s a major milestone for a franchise that didn’t have a winning season until 2009. The trick is to find a way to get to January perennially, as the Patriots have done. You can’t win it if you’re not in it. “I think everybody would like to do what they’ve done over a long period of time,” observed Kubiak. The key is maintaining stability and continuity. When Bob Kraft bought the Patriots in 1994 the franchise had had three owners, four coaches, and five quarterbacks in six years. Once the revolving door stopped with the arrival of Bill Belichick and Tom Brady, the winning started. The Texans went seven years without a winning season before going 9-7 in 2009, and didn’t make the playoffs until 2011, but they’ve laid a foundation through shrewd drafting and smart trades and free agent signings and have established an identity. “We play till the whistle, we play hard, we play aggressively, we play fast,” said general manager Rick Smith, who came here from Denver with Kubiak six years ago. In the franchise’s early days, the Texans were content to make opponents play for 60 minutes. But after the grim 2-14 campaign in 2005, their fans were running out of patience. The breaking point came after Houston, which had won the “Bush Bowl” by losing to the 49ers and earning the top overall pick, passed on both Southern Cal running back Reggie Bush and Texas quarterback Vince Young, the hometown hero who’d led the Longhorns to the national title over USC. When the Texans chose defensive end Mario Williams instead, the fans at the stadium selection party booed. The philosophy was to take the long view, drafting elite players who could be career starters and augmenting them with proven veterans from other teams and undrafted free agents who fit the Texans’ profile. The first major move they made, and arguably the riskiest, was jettisoning David Carr, the franchise’s first draft pick, and bringing in Matt Schaub, who’d started only two games in three seasons with the Falcons. The Texans finally went 8-8 in 2007 and were in the black for the first time two years later. But after the startling 2010 collapse, when Houston went into the bye week at 4-2 and finished 6-10, the front office realized that reconstruction was unavoidable. The Texans had harvested a terrific draft class in 2009 with linebackers Brian Cushing and Connor Barwin, cornerback Brice McCain, and safety Glover Quin, all of whom went on to start, and added cornerback Kareem Jackson and linebacker Darryl Sharpton the next year. What they needed was teaching and development. So they brought in Wade Phillips, who’d been dismissed as head coach by the Cowboys, but who’d revived defensive units in Denver, Buffalo, Atlanta, and San Diego. 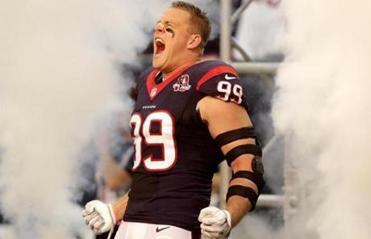 In his second season, J.J. Watt has become a menacing force for the Texans’ defensive line. In one season the Houston defense went from 30th in the league to second. Last year, the Texans drafted J.J. Watt, the titanic defensive end from Wisconsin who has a chance to be the league’s Most Valuable Player this year and spent more draft picks on cornerbacks Brandon Harris and Roc Carmichael, linebacker Brooks Reed, and safety Shiloh Keo. On offense a solid line anchored by Duane Brown, Wade Smith, and Chris Myers serves and protects an imposing troika of Schaub, Johnson, and Arian Foster, a durable thumper back out of Tennessee whom nobody else would take a chance on but who has posted three 1,000-yard seasons. So the victories have followed, a franchise-record 11 and six in a row since the October home loss to Green Bay. That would have been a wildcatter’s fantasy a decade ago, when six Ws were more than a season’s worth.